The Colorado River always delivers on its promise of spectacular scenery, even after it descends from the Colorado Plateau and empties into its lower reaches in western Arizona. In the lower basin area, you won’t find the extravagantly stratified walls that frame the river’s passage through Grand Canyon, but you will discover another form of beauty: sinuous drainages, stark desert landscapes and serrated ridgelines. You will also find some of the characteristics of the tributaries of the Colorado River’s upper reaches, for example, slot canyons. One of the more famous of the lower Colorado River slot canyons  one that offers an engaging three-mile one-way hike  is the SARA (Special Activities Recreation Area) Park Wash Crack in the Wall just south of Lake Havasu City. 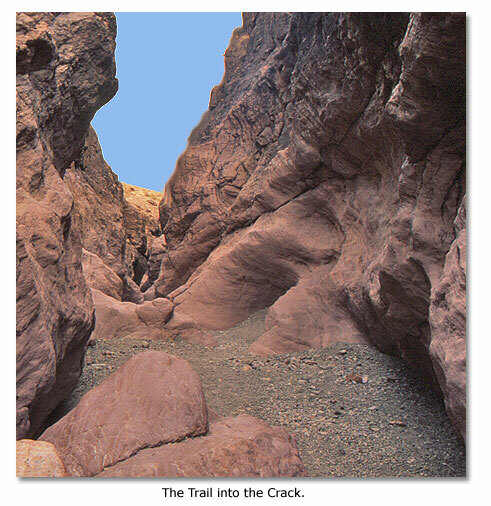 Called simply “The Crack,” this slot canyon is formed by a drainage that has carved its way through mountains then snaked around ridges, emptying into Lake Havasu. You will find the trailhead for the hike in the SARA Park, which is set amid a geologic profusion of textures, colors, strata, crumbling mountain slopes, and shallow canyon walls mortared with rubble-filled conglomerate. 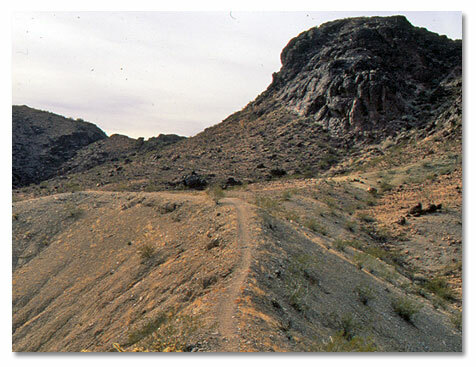 The trail will take you through The Crack, up a ridgeline, and down to Lake Havasu. The eclectic geological brew along the trail creates some stunning scenery and fine desert bighorn sheep habitat. About half a mile from the trailhead, you will come to a large cairn, which indicates that the route leaves the drainage and takes off on one of the several trails that lead to nearby hillsides. Stick with the trail that parallels the wash. It will rejoin the wash where the canyon walls start rising and narrowing, relinquishing their dark hues for salmon tinges. Beams of light shine through pinholes in the upper reaches of the rock. Arches appear. The canyon narrows to an arm’s-width. It opens into a small amphitheater, then narrows again, tumbling down a series of dry falls into The Crack. Except for a seven-foot dry fall, you can, with care, readily negotiate most of the drops. If the seven-footer causes a problem, you can get around The Crack on an upper route, but you will have to return to the large cairn and take the path that ascends the ridge. If you do negotiate the seven-foot dryfall, you will continue through The Crack. As soon as you complete the passage, look for a trail on the right, which leads to the upper route and then to the lake. From the upper route, you will catch glimpses of Lake Havasu and Lake Havasu City, and you can see into California. At one point along the upper route, the trail follows a ridge that tapers to a foot in width, and it has 75-foot slopes on either side. This may make you uncomfortable, especially if you suffer from vertigo, but it is a very short stretch. Along the upper route, the trail intersects a couple of pathways, where you will encounter some potentially confusing forks. At the first, be sure to bear to the left, although it may look as though you should turn right. At the next, about of a quarter of a mile beyond, bear to the right. Soon you will see the blue-green waters for which Lake Havasu was named. The lake, according to an Arizona State Parks ranger, got its name from an elderly Indian couple. When the lake first formed, its waters were muddy. As the sediments settled out, the lake took on its blue-green color. The couple named it “havasu,” an Indian word meaning blue-green. A quick climb up the brow of a hill, then down the other side, will take you to Balance Rock Cove, a Bureau of Land Management shoreline campground with unusual volcanic rock formations, a diving rock, and shoreline ledges ripe for fishing. 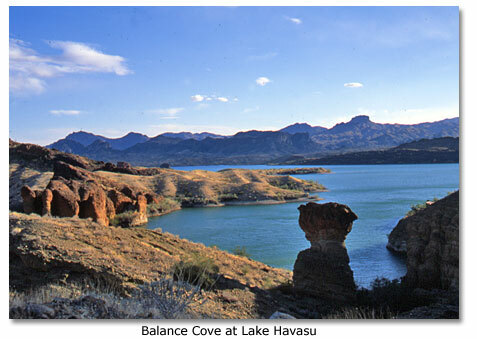 Lake Havasu is a fishing hot spot for largemouth bass, striped bass and panfish. It has produced world records for the striped bass and state records for black crappie, green sunfish and red ear sunfish. Water birds create a rookery in the cove in late spring. Bighorns often scramble down the cove’s surrounding ridgelines to the lake for water. Nighttime along the lake, removed from a city, can be magical. The water shimmers in ice blue under the jagged ridgeline of California mountains, which turn purple against the fiery fluorescence of the late afternoon sky. The daytime din of motors subsides, giving way to the sounds of nature. Fish splash on the water’s surface, chasing their evening meal of shad. Ducks produce a sudden cacophony of quacks, signaling the stalk of a bobcat. Temperatures abate after the day’s searing heat. A night breeze ripples the water, which laps gently onto the shore. In a land that normally gets only three inches of rain each year, watching the fading day and enjoying the sounds beside this watery world is a very special thing. From Lake Havasu City, go south on AZ 95, and turn left into the SARA Park (around mile marker 175), and drive to the parking area. On the hike back from Balance Rock Cove, you’ll notice a large arch on a knob of a hill just south of The Crack. The arch makes a good beacon as you make your way back to The Crack. If you don’t think you can climb up the seven-foot dry-fall, follow the upper trail over the top of The Crack then back down to the large rock cairn on the canyon floor. If you spend time at Balance Rock Cove, you’ll have to pay a recreation site fee of $10 for day use and a separate $10 fee for overnight use. You can approach Balance Rock Cove (and others along the lake) by boat. Boat camping is allowed by permit only on a first-come-first-serve basis. Arizona State Parks sites located between Red Rock Cove and Cattail Cove cost $14 each night. 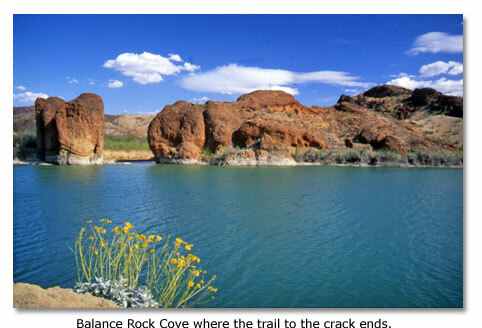 Sites maintained by the Bureau of Land Management south of Cattail Cove (such as Balance Rock Cove) cost $10 for day use and $10 for camping. Most boat camps have tables, grills, and outhouses, but no drinking water. You will need an Arizona license if you fish.